Gaming addiction turned horrifically tragic as the three-month-old daughter of a Korean couple starved to death while her parents were caring for a virtual daughter during a 12-hour MMOG session. The couple, identified only as "the Kims" due to Korean privacy laws, had met in 2008 over an online dating site and subsequently married and had a child. The husband, 41, and the wife, 25 were both unemployed, living with the parents of the wife. Both spent most of their time at 24-hour internet cafes, notorious for crowds of gamers and dense cigarette smoke, even during the pregnancy. The couple called the police in September to report their daughter's death after returning from a 12-hour gaming session. The autopsy results were chilling. The child, who had been born prematurely, died of malnutrition. The couple also admitted to feeding her rotten powdered milk as well as spanking her whenever she cried. The child was generally neglected in favor of an online daughter over the Korean MMOG PRIUS, which was consuming much of the couple's play time at internet cafes while their daughter was left alone and unfed. 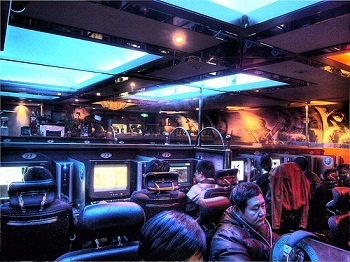 South Korea has had serious problems with gaming addiction, which has led to a number of deaths via exhaustion in the past few years. "There's no certain clinical indicator to define 'game addiction' but our study shows that brain PET [scan] images of suspected online game addicts are very similar to that of a cocaine addict," Dr. Kim Sang Eun of Seoul National University Bundang Hospital said. The problem is reportedly even higher in Korea due to the nation's 95 percent broadband access, and the fact that there are more mobile phones in South Korea than there are people. While obviously an extreme example, it is nevertheless one that cannot be ignored. Fortunately, most gamers aren't this irresponsible, but it's still a very real risk in our world.